11 Heartfelt and joyful songs composed in honor of the Dirshu World Siyum. 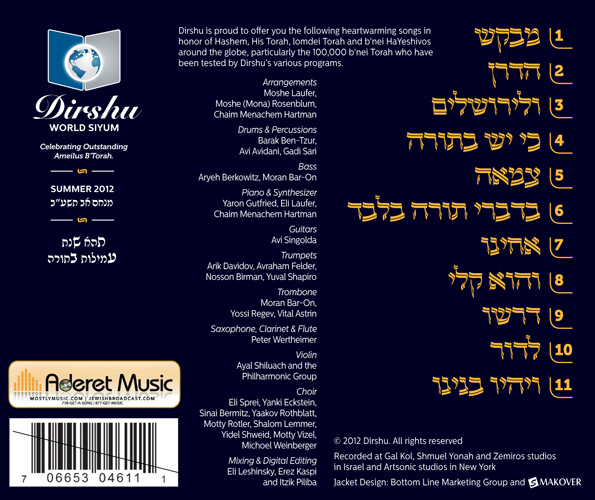 Featuring, Shlomo Daskal, Isaac Honig, Yirmiya Damen, Avrumi Roth and Shira Chadasha Choir. Arranged by Mona Rosenblum, Moshe Laufer and Chaim Menachem Hartman. Available for a special price of $9.99. You can buy the CD or download distributed through Aderet or MostlyMusic.com, available in stores now!